The Greene County Historical Society serves to collect and preserve all manner of historical and genealogical documents and records. The Society makes its archived materials available for research at its Vedder Research Library at 90 County Route 42 in the town of Coxsackie. The library is open on Tuesdays and Wednesdays from 10:00AM until 4:00PM, and again on Saturdays from 9:00AM until Noon. Appointments can be scheduled for times outside the regular hours, as well. The County Clerk's office is located at 411 Main Street in the county seat of Catskill, NY, and is home to a number of records, as well, including mortgage and property records, county court records, and others. 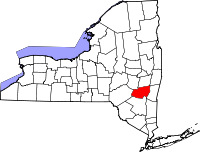 Birth and death records in New York State can be obtained by those who qualify from the town clerk in the city or town where the actual event occurred.